The goal of the Brownfields Grant Program is to support community redevelopment in the state of Wisconsin. Under the program outlined in Wis. Stat. §238.13, the Wisconsin Economic Development Corporation (WEDC) will grant funds to local governments, businesses, nonprofits and individuals for redeveloping commercial and industrial sites that have been adversely impacted by environmental contamination. Any city, village, town, county, individual or business(1) may apply for funds provided that the party that caused the environmental contamination and any person who possessed or controlled the environmental contaminant is unknown, cannot be located or is financially unable to pay for the remediation of the soil and/or groundwater. The applicant demonstrates that no activities likely occurred on the site since the Phase I and Phase II that would adversely impact the environmental conditions. Under §238.13(2)(a)1m, Wis. Stats. the recipient may not use the grant to pay lien claims of DNR or the federal Environmental Protection Agency based on investigation or remediation activities or to pay delinquent real estate taxes or interest or penalties related to those taxes. Wis. Stat. §238.13(2)(b)3 requires the applicant to contribute matching funds of at least 50% of the grant. Due to program demand, generally WEDC requires that the applicant’s eligible matching investment is at least 70% of the eligible project costs, unless the project is located in a Designated Rural County, in which case the match may be reduced to 50 percent of the eligible project costs. The maximum award generally does not exceed $500,000 unless the request for funds is for a project that, due to the size of the brownfield and the degree and extent of contamination, clearly justifies an award beyond normal parameters. Assist 14 communities or businesses and achieve a 33:1 leverage of other investment. Recipients will be required to annually submit a performance report documenting capital investment, environmental remediation and assessed taxable property values, as well as any other contract deliverables. WEDC may impose additional reporting requirements to evaluate project performance and to ensure compliance with contract deliverables. The Brownfields Grant Program has a continuous application process. Applicants for Brownfields Grants should complete an application through a regional economic development director. The completed application will be assigned to an underwriter and go through the award review process. All awards will be made in consultation with the DNR. 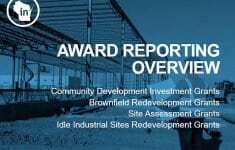 Download an informational sheet about the Brownfields Grant Program. The DNR Ready for Reuse Program is administered by the Department of Natural Resources. Ready for Reuse loans and grants are used for environmental cleanup of hazardous substances or petroleum at brownfields throughout Wisconsin. The U.S. Environmental Protection Agency’s Brownfields Program provides direct funding for brownfields assessment, cleanup, revolving loans and environmental job training. If you are interested in applying for or have questions about the Brownfields Grant Program, please contact your regional economic development director.